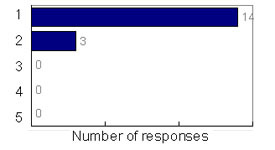 An online evaluation questionnaire was administered in the final week of the course, and 17 responses were submitted. The questionnaire was designed to include the same core questions as the questionnaire used on campus, plus others specific to an online distance course. Fifteen of the 28 questions measured satisfaction with various aspects of the design, organisation and delivery of the course, on a five-point scale, with "1" at the positive (strongly agree) end of the scale. Question 1: PHONLINE was well organized and ran smoothly. Question 2: The units were well prepared and successful. 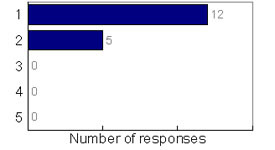 The average score for these 15 questions was 1.34, with the Mode = 1, indicating a high degree of overall satisfaction. A large majority of participants reported that they would recommend PHONLINE to other students, and that they would undertake further online courses on the basis of their experience with PHONLINE.